An extremely interesting work of imperial history by Christopher Hodson (BYU) involving an understudied episode in Canadian religious history, The Acadian Diaspora: An Eighteenth Century History (OUP 2012). The publisher’s description follows. The Acadian Diaspora tells their extraordinary story in full for the first time, illuminating a long-forgotten world of imperial desperation, experimental colonies, and naked brutality. 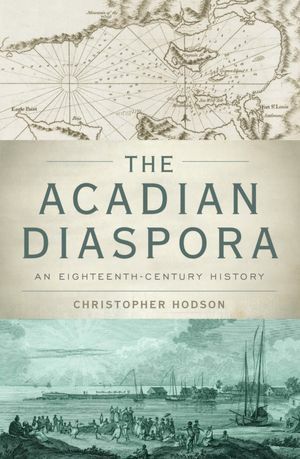 Using documents culled from archives in France, Great Britain, Canada, and the United States, Christopher Hodson reconstructs the lives of Acadian exiles as they traversed oceans and continents, pushed along by empires eager to populate new frontiers with inexpensive, pliable white farmers. Hodson’s compelling narrative situates the Acadian diaspora within the dramatic geopolitical changes triggered by the Seven Years’ War. Faced with redrawn boundaries and staggering national debts, imperial architects across Europe used the Acadians to realize radical plans: tropical settlements without slaves, expeditions to the unknown southern continent, and, perhaps strangest of all, agricultural colonies within old regime France itself. In response, Acadians embraced their status as human commodities, using intimidation and even violence to tailor their communities to the superheated Atlantic market for cheap, mobile labor.